So here you are, quite proud of yourself for making it this far, with the mountains now behind you ( Part 1 is here, for late comers. ). The next stretch will take you along the busy, and crowded, Pacfiic Coast Highway, to the start of the Coastal Bike Trail that begins at the beach at Temescal Canyon Rd. Escondido Beach, Dan Blocker, Puerco, Amarillo, Malibu, Carbon, La Costa, Las Flores, Big Rock, Las Tunas, Topanga, Will Rogers, and finally Santa Monica. The next 4 miles, to Malibu Rd., still have the great views of the beaches and the islands, on clear days. The winds off the ocean is a cooling breeze to be savored by the cyclist, and gives one the 3rd wind you need for the return to Santa Monica. This picture is looking south on PCH, from Zumirez Dr.
As you can see there is that narrow lane, on the right, where cyclists can seperate themselves from traffic. Pacific Coast Highway IS a Bike Route, and there are the little green signs, every so often, to point this fact out, but that doesn't mean the Route doesn't present problems for cyclists. For 1 thing, as you will see, that nice wide strip, above, disappears quite often, and even when its there, you can't use it because cars are allowed to park there. When you have to deal with parked cars on your right, and bumper to bumper traffic on your left, the sandwich you frequently find yourself in requires careful navigating to come out the other side unscathed. What you see here is the hill at Malibu Cove Colony. At the bottom, on the right, is the entrance. The road, on the right is a dead end, and even if it wasn't, you can't go there because the Community is private, and you won't get past the security checkpoint. You have to take the hill. Now the true fun begins, as you hit the 1st stretch of road along the beaches. As you can tell, in the foreground, you are forced to ride in the door zone of a row of parked cars. You have to watch for people so intent on getting their tans, or catching a wave, that they may not be looking behind them 1st before opening their car doors. Not to mention those folks, in, or out, of their cars, preparing to leave, or waiting to, or trying to, park. The good news is that you will not have to take that hill over to Pepperdine University. Do you see that red car near the top of the picture? It's 9 miles from Webb Way to the Bike Path entrance in the parking lot of Will Rogers State Beach at Temescal Canyon Rd..
Luckily, for all of us that SUV, that appears to want to make a turn on to PCH, was unoccupied. I DID run into a couple that were, and had drivers that were not paying attention. This genius sped past me on the left, unannounced, and he was not the only one. 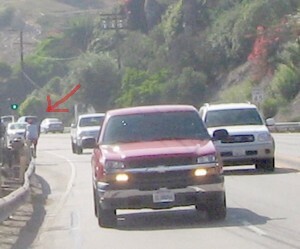 To get to the Bike Path you MUST, it bears repeating, beware of a several mile stretch of PCH clogged with traffic. All these years later nothing has changed. I felt like I was in a Cyclists version of The Charge of the Light Brigade, minus the cannon. Parked cars and foot traffic to the right of me, potential traffic violations to the left of me, rumble, rumble, zoom, zoom! I felt trapped. Then there are the occasional mindless morons coming, hell bent for leather, right at you! This idiot has a companion, just beyond him, that I could not get into the shot. Finally the Bike Path is reached, and truly safe, and sane, riding conditions await! Proceed to the final chapter!